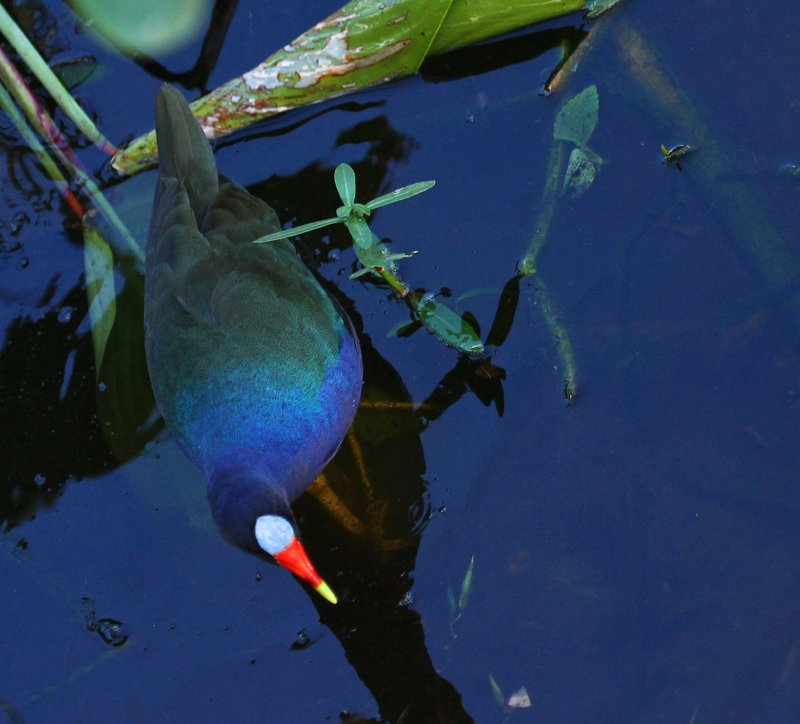 The Purple Gallinule is one of my favorite wetland birds. I loved how this one looked, surrounded by the dark green plants and dark blues of the water on a late afternoon December walk. We see them frequently here, all throughout the year. Their colors are just glorious in the sun, as their feathers truly shimmer in iridescent blues and greens. Even their beaks are wonderful, with their light blue shield, red center, and bright yellow tip! A beautiful water bird! reminds me of our Purple Swamphen which I think is pictured in my next blog. Love the colours, Seeing birds in sunlight can make a world of difference to the appreciation. Our Glossy Ibis is called by many the black Ibis, but when you see the sunlight glisten off its feathers you see a world of iridescent colours and call it glossy. We also have many non-native Purple Swamphens here in Florida, and they are often confused by people who think they are Purple Gallinules. The PG’s are much more elegant and beautiful ;)! The Swmaphens’ body shape is heavier, etc. but they also have amazing coloring in the sunlight. We have Glossy Ibis here, too, and I agree – your description is right on the mark! Now that is one colorful bird. You have the best birds in Australia. I was just reading on your snakes, you have the most venomous too. I was wondering how people avoid them there since some even come to urban areas. I think I would not sleep at night. I had that problem in Costa Rica, and outside of the giant pythons, there were only little coral snakes around, but they still freaked me out. HAHA, I’m actually in Florida, in the USA and I think we DO have the ‘best birds’, though when I compare notes with our fellow bloggers from Australia, we see a lot of similar birds. Luckily, we only have a very small number of venomous snakes – so I guess Australia outscores Florida on that one! Oh heck, I responded to the wrong blogger – I confused you with the one I just left a comment on before yours. I did get the right bird though. It is colorful. I do know you are in FL and I just goofed. I did just mention on your last post you had such a wealth of birds and how just waiting an hour, brings more in. Sorry for the mix up. I had a really long day!!!! Not to worry, GWGT! I knew you knew ;-D And, yes, you did make that same comment (as donna213) on my recent Orb Weaver post~! There are so many wonderful bloggers out there to enjoy – my “Following” list just keeps getting longer all the time! They are beautiful birds, and that’s a different view of one, something to think oabout when the opportunity offers! Thanks for your visit, Sonja. Yes, there was something I just liked about the colors together, from this top-down view!